Vietnam Veterans of America Chapter 267 member Dennis Scanland has been named Dearborn, Mich.’s 2018 Veteran of the Year of year. Scanland will accept the award at the city’s annual Veterans Day ceremony, to be held at 11 a.m. on Nov. 11. The Veteran of the Year is nominated by veteran peers and selected by a committee of past recipients. The honor recognizes ongoing service to fellow veterans and others in the Dearborn community and beyond. Scanland, now 70, enlisted in the U.S. Air Force in 1966. Once deployed in Vietnam, he served as a parachute rigger and repaired the fabric ailerons of C-47 Skytrains. “I’d write my dad and tell him ‘I’m helping win the war sitting behind a sewing machine,’” he told the Dearborn Press & Guide. 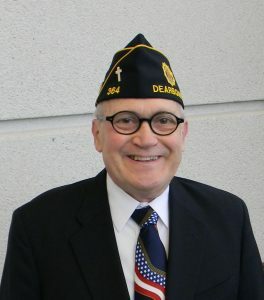 Scanland, 70, has been an active member of Dearborn’s veteran community for nearly 20 years. He often visits veterans in area nursing homes, hospitals and households, and as a funeral home director, he has helped veterans who died without resources or family members find their final resting places.